Today at Disney World, Sara fell at the playground next to Splash Mountain head first into a rock. She’s got a nasty looking wound on top of a big ole’ goose egg right on her forehead. However, she was examined by several Disney medical personnel and does not appear to have a concussion or need stitches. We’re taking her to her normal pediatrician in the morning to get everything double-checked, but she has been her normal happy self the rest of the day (with regular bandage changes and Ibuprofen). Home » Blog » Family » Disney World » Today at Disney World, Sara fell at the playground next to Splash Mountain head first into a rock. She’s got a nasty looking wound on top of a big ole’ goose egg right on her forehead. 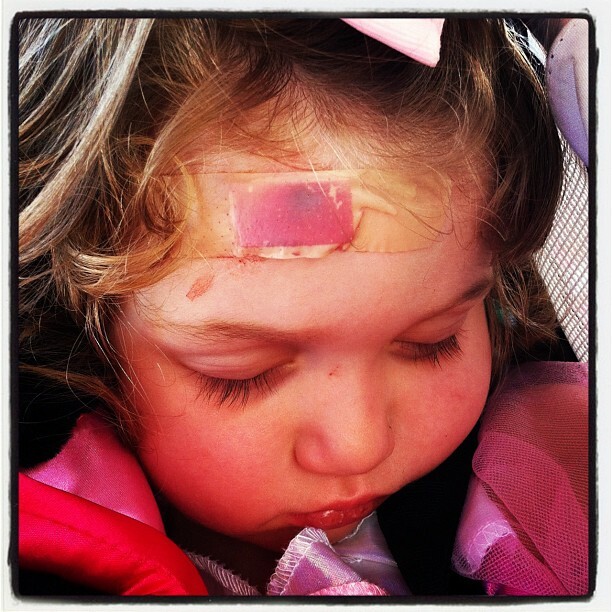 However, she was examined by several Disney medical personnel and does not appear to have a concussion or need stitches. We’re taking her to her normal pediatrician in the morning to get everything double-checked, but she has been her normal happy self the rest of the day (with regular bandage changes and Ibuprofen).